Cars lined up at Bullhead Point in Fulton on Saturday morning to drop off everything from TVs to irons during Senator Patty Ritchie’s Electronics Recycling Event. “People started coming before it was open today,” Senator Ritchie told Oswego County Today. When items are dropped off they’re sorted before being loaded into a trailer and weighed to see what United Way’s donation will be. The event, held from 10 a.m. to 1 p.m, saw a steady stream of cars all morning and into the afternoon. It was co-sponsored by the senator, Sunnking Electronics Recycling and Time Warner. “This is something a couple of my colleagues have done across the state and they said they had a huge turnout. And, it looked like there was a real need for the area here,” said Senator Ritchie. All community members had to do was drive over to the location and stay in their cars. Volunteers from the United Way of Greater Oswego County unloaded items and sorted the items. Cindy Jessop from Sunnking, Senator Patty Ritchie, and Alice Kim from Time Warner represent the co-sponsors for the event. The only items Sunnking won’t recycle are alkaline batteries and items containing Freon, such as air conditioners. 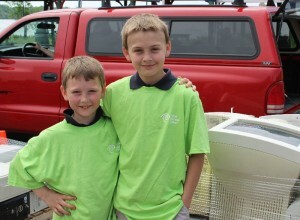 Dillon and Gunnar Nerber were the youngest volunteers and were “having fun” helping people unload their vehicles. “We thought it would be nice,” Dillon explained. 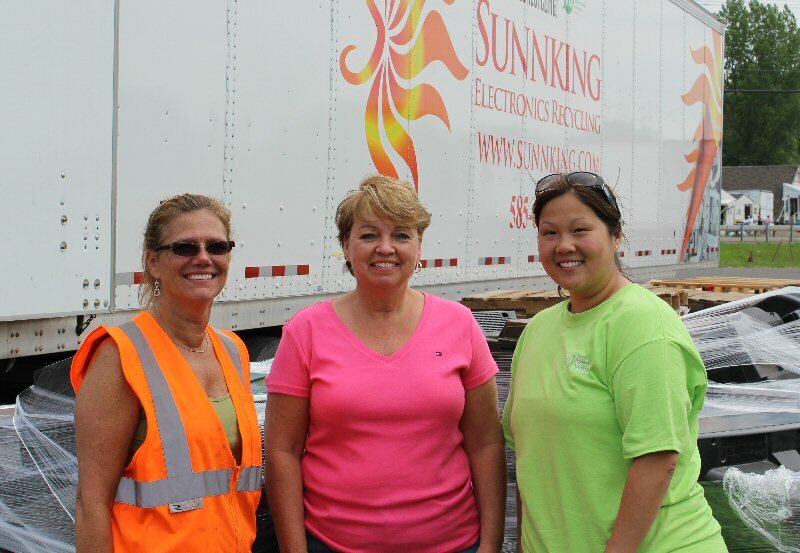 “We’ll dismantle and get as much value as we can, separating metal and plastic,” said Cindy Jessop, director of community outreach for Sunnking Electronics Recycling. Jessop helps organize events like this all over New York and Pennsylvania. “About 10% of what we see at a public collection event can be refurbished,” Jessop added. According Senator Ritchie, the three most-dropped-off items were TVs, microwaves and computers. Dillon and Gunnar Nerber take a moment to pose for Oswego County Today in between helping unload cars. Sunnking has “a very secure process” of wiping personal information from electronic devices such as computers and cell phones. They do this before dismantling or refurbishing any item, Jessop said. The event also doubled as a donation for United Way of Oswego County. “We’ll share a penny per pound of material collected,” said Jessop. At the end of the day, United Way will walk away with more than $300, and all the money stays in Oswego County. Sunnking attempts to hold a recycling event every weekend in various locations. After the success in Fulton all parties are looking to make the electronics recycling an annual event.